The moment you drastically cut down on the carbs you are eating, all the water that you have been retaining gets flushed out of your body. Therefore, those first few kilos that seemed to just melt off you in a short space of time, is mainly water that has been lost. Your bloated look will go away, and your body will then be perfectly primed to start losing fat weight. The key is not to give up if weight loss slows down. 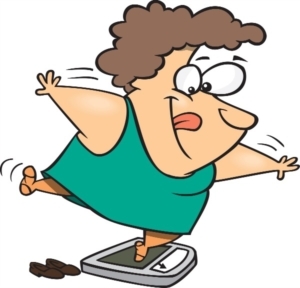 After the initial weight loss, which is mostly water weight, one can expect to lose between 0.5 and 1 kilo of fat per week. This might not seem like a lot but over time it all adds up. Besides, don’t focus too much on what the scale is telling you. Rather go by how your clothes are feeling or take a tape measure and keep track of your disappearing centimetres that way. Also know that if you happen to have a meal that is high in carbs and the next day your scale says you are up by 1,5 kilos, don’t despair. What is happening is just the converse of the above. A higher carb intake (yes, even from one meal), will encourage some water retention. You have not gained 1.5 kilos of fat – this is physically impossible. Just go back to your low carb diet and that water weight will disappear quite quickly again. Another important thing to consider when comparing your weight loss to others (which is always a bad idea), is that some people have more weight to lose and everyone’s metabolism and activity levels are different. The closer you get to your goal weight, the slower the weight loss can become – it doesn’t mean you will never get there (unless your goal weight is unrealistic of course). Focus on YOU and adopt a version of low carb that is sustainable over the long-term. Make it a life-style and enjoy the process. This time next year you could be looking at a very different reflection in the mirror. If you would like some help, please contact one of our experienced and knowledgeable Banting Buddies coaches for assistance.